Q. When and where will the book be available for purchase? A. Lost Vegas is available at Lulu.com. Click here to buy a copy. You can also buy it on Amazon.com. Q. Will there be an e-version of the book? A. The e-book version is available for Kindles. Click here to buy a copy for your Kindle via Amazon.com. 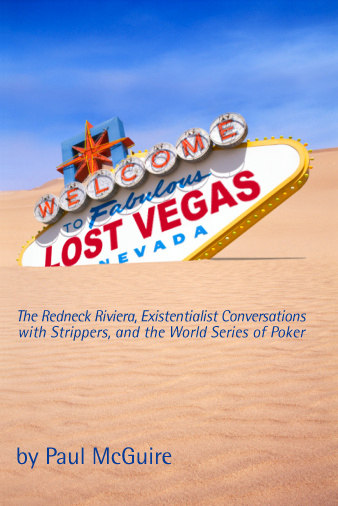 Or, you can click here to buy a PDF version of Lost Vegas via Lulu.com. Q. Will there be an e-Pub version of the book for iPads, etc? A. If you have a Kindle app for your iPad, click here to purchase a Kindle-ready version via Amazon.com. Q. Can I get an autographed copy? A. None are for sale online, but shoot me an email and we can work something out. Q. Can I get a free copy? A. No. I've been writing for free on Tao of Poker and other blogs for many years and I have never asked for a cent. Here's your chance to make it up. It's taken me five years to write this book, I have to earn a living somehow. Q. Can I get a review copy? A. Review copies are available if you qualify. Please contact me at pauly AT taopoker DOT com. Q. Will there be a hardcover version? A. At the present moment... no. However, if there is a significant amount of interest, I will consider launching a hardcover collector's version in a few months. Q. How do I contact you to do an interview? A. Shoot me an email at pauly AT taopoker DOT com. We can arrange something. Q. I live in a country outside of America. Can I get a copy? A. Yes. The shipping might be pricey, but Lost Vegas is available for delivery to most places on Earth. Q. When will the French version be available? A. Inculte is publishing Lost Vegas in French. Benjo wrote the translation. It will was at the end of May 2011. Q. Will there be other translated versions? A. I'm in the process of negotiating a Spanish version and a German version. At the present moment, Lost Vegas will only be available in English and French. Q. Will there be a sequel to "Lost Vegas"? Any other questions? Please send me an email. Thanks.